The last time British Airways changed its Executive Club program was about 3 years ago when the airline made redemptions based on individual sectors, but today marks the next big changes to the British Airways Executive Club program. If you’re thinking of taking advantage of the American Express to British Airways 40% transfer bonus, you may want to re-evaluate. The new changes that British Airways is announcing will go into effect on April 28, 2015, so you still have time to lock in awards at the old levels, as anything booked before then will be honored at the current rates. The most drastic changes to the new British Airways program are for business and first class awards, which are increasing by as much as 150%. 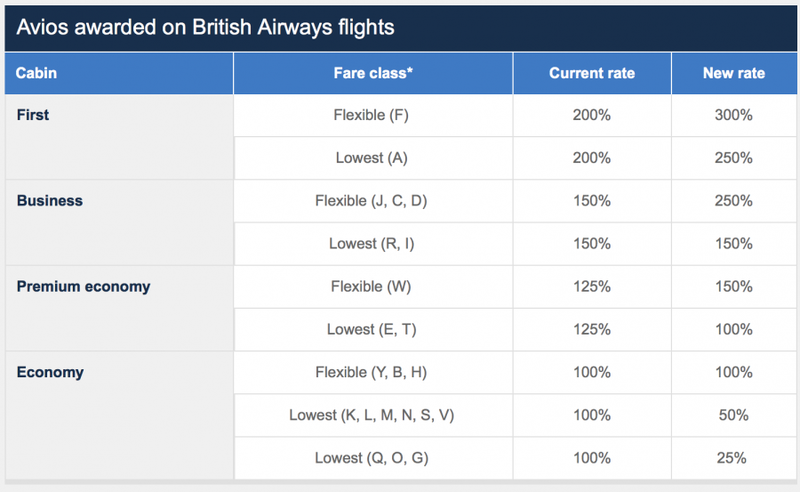 If you’re one to redeem for only economy flights, the good news is that coach awards on British Airways and its partners aren’t changing, so you can still book short-haul partner flights for 4,500 Avios each-way. British Airways is making more changes to its Executive Club program. British Airways is changing how you earn Avios when flying. While British Airways will be increasing the mileage earning structure for First and Business class fares, there will be a drastic decrease in the earning rate for economy—down to only 25% on their cheapest economy fares. 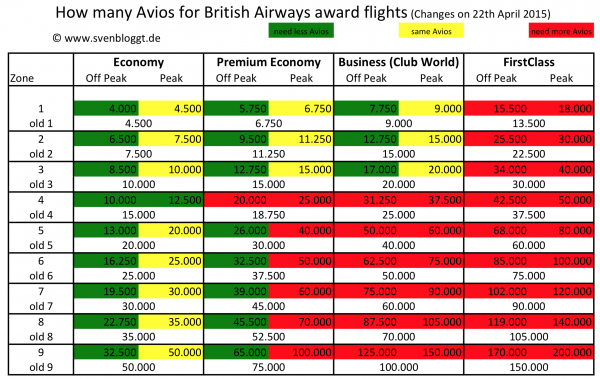 New award chart for redeeming on British Airways. When it comes to redeeming, British Airways will drastically increase the number of Avios needed for Business and First class redemptions. 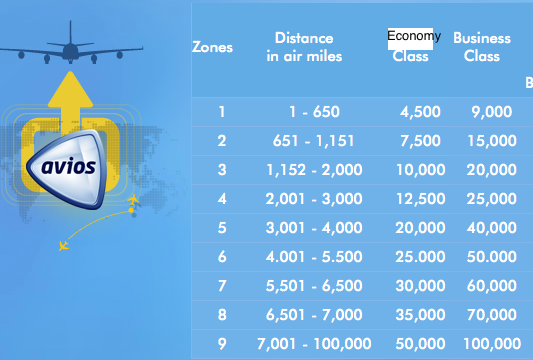 However, this chart doesn’t indicate which flights are in each zone, so below is an old chart that shows each zone based on the distance in air miles. British Airways will also introduce Avios pricing for award flights depending on the time of the year, the cabin, and the zone. During peak times of the year there will be a standard Avios price, and for less busy, off-peak times fewer Avios will be needed. The previous award chart, showing the distances pertaining to each zone. What do these Business Class increases mean? Redeeming from New York to Los Angeles will now cost 75,000 Avios round-trip in Business Class compared to 50,000 Avios before. Redeeming on Aer Berlin from Miami to Berlin used to be 100,000 Avios, but will now cost 150,000 Avios round-trip. 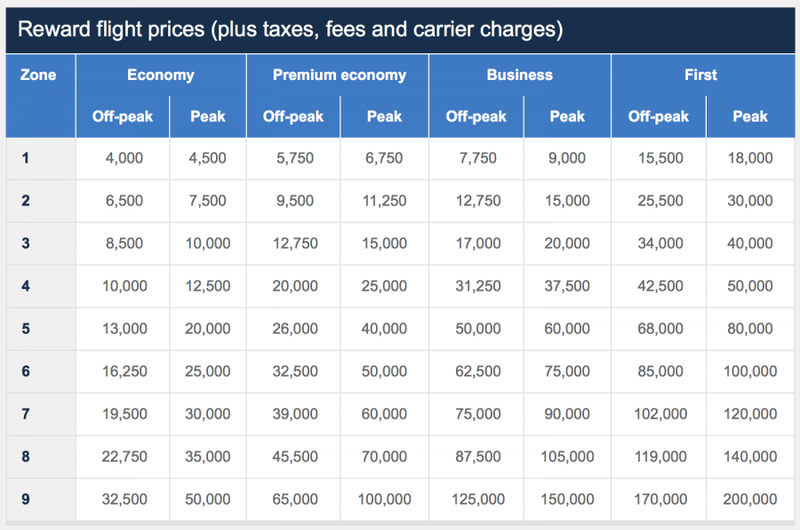 Are Oneworld and other partner airlines also introducing peak and off-peak travel periods? No. If you would like to redeem Avios to fly with British Airways airline partners, you’ll need to use peak Avios pricing all year round. There will be no off-peak pricing available award flights with airline partners. So even though British Airways is introducing off-peak awards, you won’t be able to take advantage of them if you redeem on partners, which most of us do. This is also is big blow to those with the Travel Together companion ticket, because even though you were previously hit with huge fees, at the least the miles required were low. New York to London was 80,000 Avios, but will now be 120,000. Since you have nearly 3 months to book flights at the old prices, now would be a great time to get the British Airways Visa Signature Card, which is currently offering a 50,000 Avios sign-up bonus after spending $3,000 in purchases within the first 3 months, and $95 annual fee. For long-haul Business and First class redemptions, we’re seeing an increase of 50% in what it will cost you to redeem, which is a huge amount that shouldn’t be taken lightly! The only silver lining that I can see is that economy awards aren’t changing, so if you’re only redeeming for economy awards, then you shouldn’t be affected by these changes. Be on the lookout for more upcoming posts discussing the “sweet spots” of this devaluation. What are your thoughts on these changes to the British Airways Executive Club Program?